It's been a good week on the dairy farm, and we've made some progress on several fronts. We are finally having more cows freshen than the are drying off, so our milking herd size is beginning to increase. Milk production (per cow) is also continuing to improve, albeit slower than what we would like. 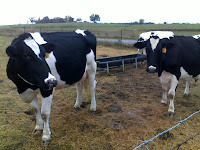 More of our cows are showing stronger "heats" in the cooler weather, and our conception rates are probably on the rise. The rainfall we received during the first half of the week has really got the first rye and triticale we planted jumping out of the ground. We've also been able to no-till triticale and oats into one field, and I'm currently about halfway through planting oats into 45 acres of prepared ground. I doubt I'll plant over the weekend, and should finish with that job on Monday. We'll still have quite a few acres of grazing land to no-till drill rye and ryegrass into, but we're not any any big hurry about it. And while this has been a good week, we are still facing some very real challenges. with our feeding program. Our purchased feed costs have continued to rise, offsetting the gains we've made on our milk price. We're currently looking at different nutritional options for both our heifers and our cows, and it might be more profitable to sacrifice some milk production as long as we don't sacrifice overall animal health. Whatever happens, we'll do our best to just roll with the punches and make the best of the situation. My family has been able to do that successfully on our dairy farm for nearly 60 years, and I don't see a reason to change that now! I guess the dairy farming life is always busy, but the past couple of weeks have seemed a little slow since we've not had any field work or extra herd work to attend to. That's about to change, though. Yesterday evening we received about an inch of long prayed for, hoped for, and awaited for rain. With moisture in the ground and 275+ bags of seed in our shed, it's time to get busy planting our cool-season forages. I'll begin drilling rye (AFC 20-20) into prepared ground tomorrow morning, and will also plant a few acres of triticale (Trical 2700) before I finish sometime on Friday. Depending on the field conditions and the timing of the next rain chances, I may begin drilling our oats (Coker 227) over the weekend. That will take care of all the forage we intend to harvest as silage next spring, but will still leave all of our grazing land yet to be planted. We'll no-till drill in a mixture of rye (Elbon) and ryegrass (Marshall) for our cows to rotationally strip-graze next spring. It's doubtful at this point that we would get any significant grazing out of it before then, so we probably won't plant that acreage for another week or two. Of course, there's more work to do on our dairy farm than just planting forages for our cows. Our local veterinarian is coming next Tuesday morning to pregnancy check about 40 cows and 40 bred heifers. About a dozen of our pregnant milking cows are due to dry off early next week, and at least half that many dry cows should calve before the end of next week. 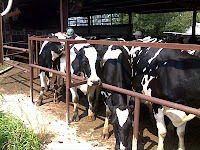 We'll also be re-grouping our heifers (by size) and moving them to different pastures over the next couple of weeks. I've also got a very busy off-the-farm schedule lined up. I was in Montgomery this past Monday for an ADA of Alabama board meeting (dairy check-off) and a dairy show at the Alabama National Fair. Next Wednesday I'll be traveling to the National FFA Convention in Indianapolis to serve as a judge at the Extemporaneous Public Speaking CDE Finals, as well as to promote Farm Bureau's Young Farmers & Ranchers Program with a few fellow YF&R Committee members. Yep, it's gonna be a busy few weeks, but I wouldn't have it any other way! We're still facing dry conditions here on the farm, and our fall forage planting will continued to be delayed until a fair amount of rain can fall. The US Drought Monitor currently has us designated as D0, or "abnormally dry". I expect that we'll be bumped up to the moderate drought category next week unless the weather makes a big change. In the meantime, we're still finding plenty of things around the farm to keep us busy. For one thing, the drier weather has allowed us to do some much needed brush cutting in a few spots. It has certainly improved the looks of the place, and it will give our heifers a few more acres of "clean" ground to pasture on this winter. And, of course, our cows still demand a lot of our attention. We are currently up to 182 milking, but we'll cut that down this afternoon as we have a few to dry off. Their milk production continues to climb, thanks in part to the improving quality of their corn silage as we get deeper into the bunker. We're also letting our animals graze down the remaining sudex on the farm, with the milking herd spending late mornings in one large paddock and our dry cows picking through a 10 acre field.